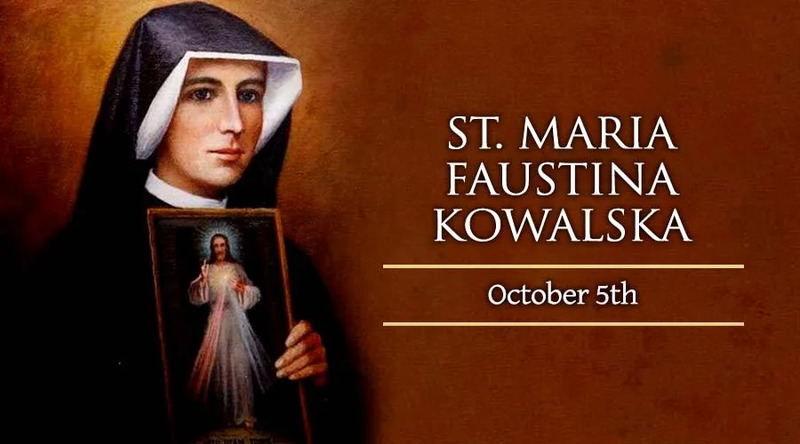 On October 5, the church celebrates the Memorial of St. Mary Faustina Kowalska, virgin. St. Faustina was born Helena Kowalska on August 25, 1905 to a poor but devout Polish family in 1905. At the age of 20, with very little education, and having been rejected from several other convents because of her poverty and lack of education, Helen entered the Congregation of the Sisters of Our Lady of Mercy. There, she took the name Sr. Faustina and spent time in convents in both Poland and Lithuania. Throughout her life, Jesus appeared to Sr. Faustina. He asked her to become an apostle and secretary of his mercy, by writing down his messages of Divine Mercy for the world in her diary. Jesus also asked Sr. Faustina to have an image painted of his Divine Mercy, with red and white rays issuing from his heart, and to spread devotion to the Divine Mercy novena. Even before her death on October 5, 1938, devotion to Divine Mercy began to spread throughout Poland.This little nun and Jesus’ message of Divine Mercy impacted Karol Wojtyla greatly, which became obvious to the world when he was elected Pope. “It is truly marvelous how her devotion to the merciful Jesus is spreading in our contemporary world and gaining so many human hearts! This is doubtlessly a sign of the times — a sign of our twentieth century. The balance of this century, which is now ending, in addition to the advances which have often surpassed those of preceding eras, presents a deep restlessness and fear of the future. Where, if not in the Divine Mercy, can the world find refuge and the light of hope? Believers understand that perfectly,” Pope St. John Paul II wrote. “Today my joy is truly great in presenting the life and witness of Sr Faustina Kowalska to the whole Church as a gift of God for our time. By divine Providence, the life of this humble daughter of Poland was completely linked with the history of the 20th century, the century we have just left behind. In fact, it was between the First and Second World Wars that Christ entrusted his message of mercy to her. Those who remember, who were witnesses and participants in the events of those years and the horrible sufferings they caused for millions of people, know well how necessary was the message of mercy,” the Pope said in his homily that day. It was also on this day, the Sunday after Easter, that Pope John Paul II instituted the Feast of Divine Mercy, which Jesus had asked for in his messages to Sr. Faustina.